The JVM is the Java platform component that executes programs. The JRE is the on-disk part of Java that creates the JVM. The JDK allows developers to create Java programs that can be executed and run by the JVM and JRE. Developers new to Java often confuse the Java Development Kit and the Java Runtime Environment. The distinction is that the JDK is a package of tools for developing Java-based software, whereas the JRE is a package of tools for running Java code. The JRE can be used as a standalone component to simply run Java programs, but it's also part of the JDK. The JDK requires a JRE because running Java programs is part of developing them. Figure 1 shows how the JDK fits into the Java application development lifecycle. Technical definition: The JDK is an implementation of the Java platform specification, including compiler and class libraries. Everyday definition: The JDK is a software package you download in order to create Java-based applications. In addition to the JRE, which is the environment used to run Java applications, every JDK contains a Java compiler. The compiler is the software program capable of taking raw .java files--which are plain text--and rendering them into executable .class files. We'll see the compiler in action soon. First, I'll show you how to download and setup a JDK in your development environment. Getting Java setup in your development environment is as easy as downloading a JDK and adding it to your classpath. When you download your JDK, you will need to select the version of Java you want to use. Java 8 is the version most commonly in use, but as of this writing Java 10 is the newest release. Java maintains backward compatibility, so we'll just download the latest release. In addition to choosing your Java version, you will also need to select a Java package. Packages are Java Development Kits that are targeted for different types of development. The available packages are Java Enterprise Edition (Java EE), Java Standard Edition (Java SE), and Java Mobile Edition (Java ME). Novice developers are sometimes unsure which package is correct for their project. Generally, each JDK version contains Java SE. If you download Java EE or Java ME, you will get the standard edition with it. For example, Jave EE is the standard platform with additional tools useful for enterprise application development such as Enterprise JavaBeans or support for Object Relational Mapping. It's also not hard to switch to a different JDK in the future if you find you need to. Don't worry too much about choosing the correct Java version and JDK package when you are just starting out. Since the JDK supplies the compiler for your Java programs, the JDK you use determines what Java version you are able to code in. For example, if you want to use the newer functional support found in Java 8, like the arrow Lambda operator, then you need at least the Java 8 JDK for compiling. 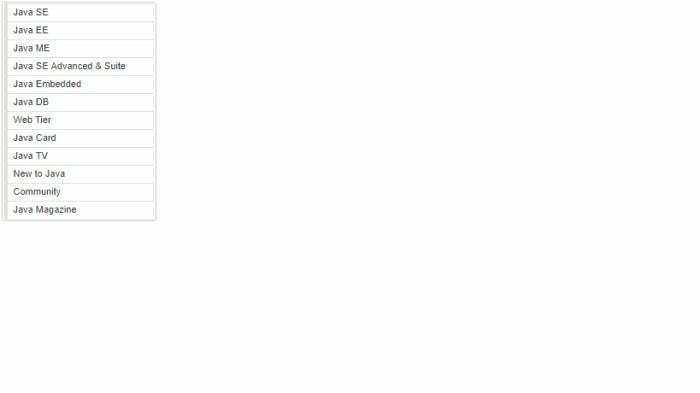 Otherwise, the javac command will reject the code with a syntax error. We'll stick with Java SE for this tutorial, so that we can focus on the core JDK classes and technologies. To download the Java SE JDK, visit Oracle's official download page. You'll see the various JDK packages available, as shown in Figure 2. Before you select the Java SE download, take a minute to look at the other options. There's a lot cooking in the Java kitchen! You would download a Java EE JDK if you were primarily interested in building Java-based web applications. The Java EE JDK includes the Java Servlet specification, which supports HTTP request handling. Every Java EE JDK implementation also requires a container, which is a server that runs Java EE applications. Glassfish is the Java EE server reference implementation for Oracle. Other popular implementations are Tomcat and Jetty. Go ahead and download the Java Standard Edition JDK. Options for that are shown in Figure 3. When you run the JDK installer, you are offered a selection of three components: Development Tools, Source Code, and Public JRE. You may install one or all of them. In this case, just select the default. Installing the "Development Tools" option gives you the JDK proper. Installing "Source Code" contains the sources for the public classes in the core Java API. Including this option allows you to reference the source code when building apps. The third option, "Public JRE," drives home that the JDK and JRE are separate entities: the public JRE can be used by other programs to execute Java programs, and can be installed separately from the JDK. Go ahead and install all three components and accept the defaults for each one. Doing this means your JDK and JRE will be installed in the default locations for your operating system. On Windows, that's C:\Program Files\Java, as seen in Figure 4. 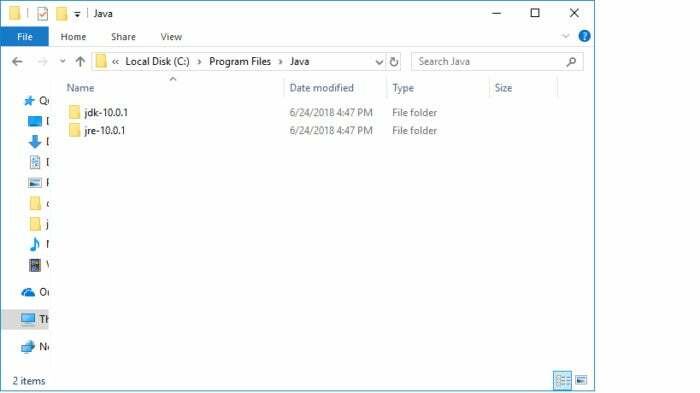 It's good to have java installed, but what about javac? You'll need this JDK element to compile your Java files. The javac command lives inside the /jdk directory, but is not automatically added to the system path during installation. We have the option to install javac ourselves, or we could install an IDE that includes this command. We'll start by compiling and running a Java program the old-fashioned way. Create a new text file, called Intro.java and place it somewhere on your computer, like your Documents folder. Next, add the code from Listing 1, which is a very simple Java program. Next, use the JDK compiler to turn your text file into an executable program. Compiled code in Java is known as bytecode, and carries the .class extension. You'll use the javac command, which stands for Java compiler. Type the full path to the command into your command shell, and pass the Intro.java file as a command. On my system, that looks like Listing 2. That should result in a successful compile. The javac will not respond with a success message; it will just output the new file. Any errors will result in console output. You should now see the Intro.class file in the same directory as Intro.java. You can run it by typing: java Intro, which will result in Listing 3. Note that you don't include the .class when typing this command. The javac is the star of the JDK, but the /bin directory contains other tools you will need. Probably the most prominent after javac is the jar tool. A .jar file is a packaged set of Java classes. Once the compiler has created the .class files, the developer can put them together in a .jar, which compresses and structures them in a predictable fashion. Let's convert Intro.class to a jar file. Navigate back to the directory where you placed your Intro.java, and type the command you see in Listing 4. The -cp switch tells Java to add the jar to the classpath. A .jar file is overkill for this tiny program, but they're indispensable as programs grow in size and rely on third-party packages. 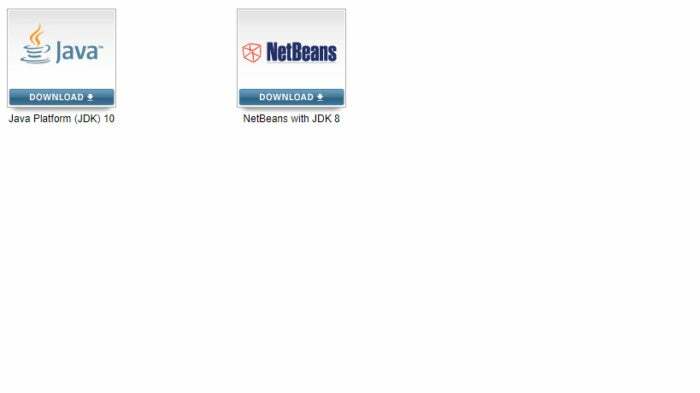 Looking back to the JDK download page, you may have noticed the option to download the JDK with the Netbeans IDE. An IDE, or integrated development environment, is software that provides a cohesive set of tools for developing applications. Think of an IDE as a visual operating system with a set of tools, like a file browser and text editor, with additional capabilities specific to development, like code completion and formatting. In Java development, one of the key things the IDE does is manage compilation for you. That is, the IDE automatically runs the compile process in the background so you don't have to continually do it yourself. An IDE also provides play-by-play feedback as you go, catching coding errors on the fly. Several solid IDEs exist for Java. 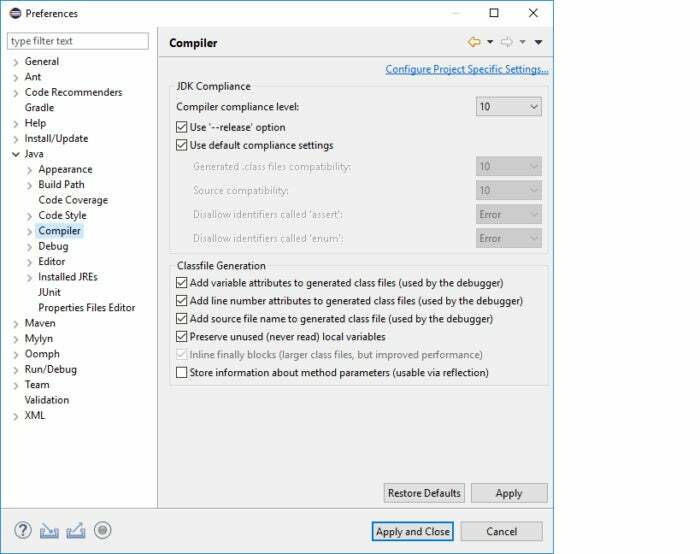 You've seen how the JDK works on the command-line, so now Let's take a quick look at how it works in the Eclipse IDE. Installing Eclipse is outside the scope of this guide, but it's a simple process. Eclipse includes an installer like any other program, and you can find the right installer for your operating system here. With Eclipse installed, open the Window menu item from the menu bar and select preferences. Inside the preferences window, you'll see the Java item. Open it, and inside you'll see the Compiler item. Clicking that will reveal some options for the JDK. Figure 5 shows a screenshot of the JDK options in Eclipse. As previously mentioned, you will need to select the correct JDK version for your project. Under the hood, the IDE will run the JDK compiler, just as you ran it from the command line. The Eclipse IDE also has its own JDK instance. The IDE manages the JDK and JRE for you, which makes life much easier! This article is the second in a short series introducing three core Java platform components: the JVM, JDK, and JRE. Look for the next article in the series, where you'll learn all about the Java Runtime Environment.